Cannot be Normal Summoned/Set. Must be Special Summoned (from your hand) by shuffling 5 of your banished Dinosaur monsters into the Main Deck. Once per turn, when your opponent activates a Spell/Trap Card (Quick Effect): You can destroy 1 Dinosaur monster in your hand or face-up on your field, and if you do, negate that activation, and if you do that, destroy that card. If this card is sent to the GY by a card effect: You can add 1 “Evolution Pill” Spell from your Deck to your hand. You can only use this effect of “Overtex Coatlus” once per turn. Overtex Qoatlus is a card that’s keeping the Dino deck strong, despite being hit by the banlist again. “Cannot be Normal Summoned/Set.” is never a good start to a monster, but this card manages it well. Cycle back 5 banished Dinos into your Main Deck can be done, especially with all the banishing the deck already does with UCT and Miscellaneousaurus. A downside is not being able to cycle back any Extra Deck Dino monsters, but again, you should be able to attain this requirement fairly easy. A one-for-one negate and destroy spell/trap effect, costing you a Dino in the hand or on the field is a great protection/stun effect. In addition, destroying a Dino will likely activate that Dino’s effect and allow you to plus. You get an “Evolution Pill” search off Qoatlus hitting the grave in any fashion, but some Dino decks don’t run Evolution Pill cards. It has synergy with being a DARK and Dino, Levle 7 makes it unable to be traded in, but it still works with the main Dino support cards. You want this card mid-to-late game, getting this in the first hand without a way of getting it out makes it a pretty dead card or merely fodder for a card like Diagram. Dino players could run 1-2 of it, 1 for sure to see how it fits within their builds. I’m not sure about 3 though. Well, honestly didn’t expect more Dinosaur support, but will not complain that we got it. Welcome a new boss monster for Dinosaurs, Overtex Qoatlus. Overtex is a Level 7 Dark Dinosaur with 2700 ATK and 2100 DEF. Stats are nice, level is fine, type is good considering this is meant for Dinosaurs, and attribute is good. Overtex cannot be Normal Summoned or Set and must be Special Summoned from the hand by shuffling 5 banished Dinosaurs into the Main Deck. They didn’t want you recycling Extra Deck Dinosaurs I see, but I think the only real decent one might be Jurrac Meteor since the Evolzaurs are Dragons. Correct me if I am wrong on that part though. You can also use Double Evolution Pill to get this from the deck, which I will discuss Evolution Pills in a bit. Once per turn, quick effect, when your opponent activates a Spell/Trap, you can destroy a Dinosaur from the hand or face-up on your field to negate and destroy that card. This does match what Dinosaurs were wanting to do with the Structure Deck, destroy the babies to get Dinos from the deck, and now you can destroy them to negate cards. I like that effect on Overtex. Finally, if Overtex is sent to the GY by card effect, you can add an Evolution Pill from the deck to the hand. I will be honest, Double Evolution Pill is the only good one, the others are honestly pretty bad. With that said, this does not make Overtex bad, because Double Evolution Pill is amazing and searching it now is outstanding. This is a hard once per turn effect, but that is fine because I believe Double Evolution Pill is a hard once per turn as well. 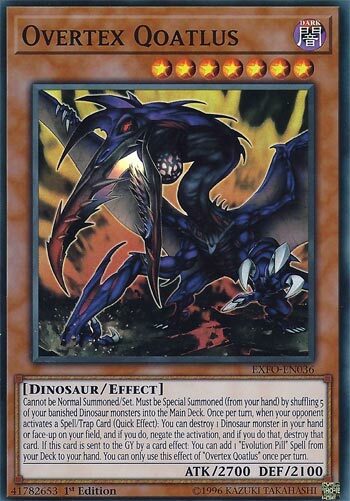 I like this card for Dinosaurs, if you are still playing the deck, you are likely playing this card. This guy really looks like more of some demonic Dragon then Dinosaur, but that’s just me. Overtex Qoatlus is a great Dinosaur card. I know it’s only Level 7, but I do wish it’s 2700 attack (still good) would be 2800 (and the 2100 def isn’t bad either). This card can’t be Normal Summoned or Set, but can be Special Summoned by shuffling 5 of your Dinosaurs back into the Deck who have been removed from play. I like this a lot, it’s a twist on Judgement Dragon, and recycles resources, which is a good thing folks. What next…well, once a turn, by destroying a Dino from your Hand, or face-up from your Field, negate the activation of a Magic or Trap card and destroy it. Destruction/negation effects are fun, and that one isn’t bad. Finally, if sent to the Graveyard by a card effect (open as to who did this, which is great) you can add an Evolution Pill Magic card from your Deck to your Hand. There are a handful of those cards these days, most of them being from bad to meh, (exception going to Double Evolution Pill, easily the best one) but it’s still nice to get something when something is destroyed.